Tumblr users awoke this morning to find the blogging platform experiencing another round of unanticipated downtime. Was server maintenance to blame? 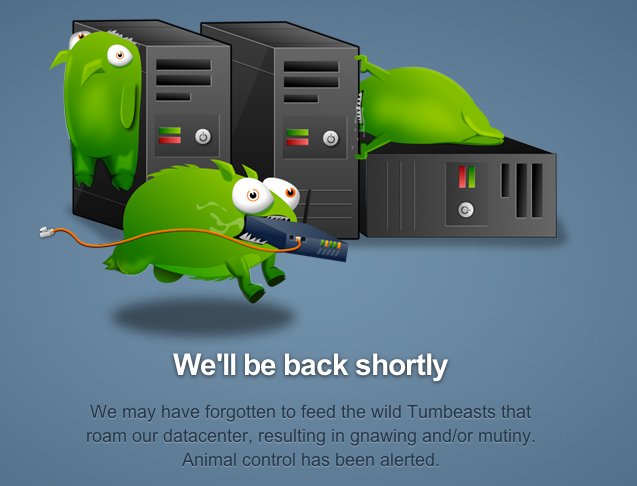 Perhaps an errant Tumblebeast loose among the mainframes? No. Tumblr is rolling out its new Explore pages, designed to group Tumblr's huge amount of wide-ranging content into a highly visual page that match's the blogging network's signature sleek design. "It's hard to organize Tumblr blogs by topic. A single one of your blogs may include your personal updates, your art, your opinions and a YouTube video of a cat speaking Japanese, all in a single day. This has been a real limitation of the current Tumblr Directory," wrote product director Joshua Nguyen on the Tumblr Staff blog at the end of February, introducing the feature to the community. "So, for the last few weeks we've been experimenting with some brand new tools for exploring Tumblr. The new Explore page organizes and filters posts by tag. This means that every tagged post has a chance to show up in front of an audience of millions that might not otherwise see it. Think Tumblr Radar by topic." The Explore pages are a natural evolution from Tumblr's tagged pages, which began with News, Fashion and Long Reads and quickly expanded to cover myriad other topics. Tumblr's Egypt channel, launched shortly after the outbreak of the January 25 protests and curated by members of the community (including The Atlantic), garnered praise as an on-the-fly channel for organizing the torrent of images, video and reports coming out of the country. A similar channel was developed to cover the unrest in Libya. Tumblr's new Explore feature serves an alternative purpose, apart from providing easy navigation through the site's ecosystem and a injecting a journalistic sensibility into Tumblr's easy curation model. Business Insider's Pascal-Emannuel Gobry speculated during Tumblr's initial roll-out of its channel pages in December 2010 that the company's new channel page could form the basis of a new advertising network, although Tumblr's channel pages remain prominent primarily to frequent users of the community. Navigating Tumblr's vast network of blogs isn't entirely intuitive, especially to outside users who may be introduced to the site through a single-serving Tumblr like Hungover Owls or The Lisa Simpson Book Club (which i happily edit, for full disclosure). "Most Tumblr blogs, like most people, aren't so easily categorized in the way you presume -- we're interested in sports, and robots, and shoes, and the Middle East. Tumblr blogs display a wide range, one that's not so easily put into a particular box," wrote Mark Coatney, Tumblr's media evangelist, on his on Tumblog in Feburary in response to a complaint from a community member. "What the new Explore/Curated tag pages are designed to do is to introduce people to the most interesting items. The Explore page sorts by popularity because we think that's a useful lens on this; we could just as easily sort by activity on a particular tag, or alphabetical order, for instance (which is how the old directory is sorted)." As of the time of this writing (10:30 a.m. EST), Tumblr is still experiencing persistent outages, making a thorough evaluation of the new feature's functionality difficult. Building on the success of it's channel pages, Tumblr's new Explore pages seem to be the next logical step for the expanding company. Turning a one-stop page into a one-stop portal could allow Tumblr to expand it's readership to even more non-regulars.